4" Trapezoid Side Steps - Accessories Inc.
4” Trapezoid Side Steps are constructed of high quality, mirror finished T-304 stainless steel. 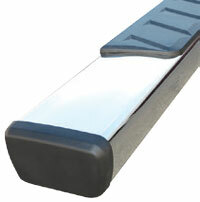 The design of the bar provides a flat step area with UV resistant, deep-tread step pads. Rocker mount design includes brackets and hardware feature injection molded trim covers. These bars are covered by Limited Lifetime Warranty. TrailFX 4″ Trapezoid Side Steps carry a Limited Lifetime Warranty to the original owner. Treat yourself to a life of looking good and dependability. TrailFX 4″ Trapezoid Side Steps have heavy-duty plastic end caps that protect the end of the step and withstand punishment from road debris. Dual, UV-resistant, deep-tread step pads offer a secure stepping surface and will endure the elements.